28 comments to BEA Plans? I’m most looking forward to the Adult Author breakfast on the Thursday (with Jon Stewart as host) and the Editor’s Buzz sessions (Adult Books on Tuesday at 4:30pm and YA Books on Wednesday at 2pm). Outside of the BookExpo proper, I can’t wait for the Lit Pub Crawl on Thursday night. Last year I planned on the flight there! So no real plans yet. You are my hero right now Jen. That website has me uber confused so I keep putting off trying to figure things out. I figured if it comes down to it I will just go with the flow, wander around and try not to appear lost 😉 So basically I am useless in helping you get together a list as event wise I have no idea – I would love to meet you though! Well, as you all know because I whine about it weekly, I’m not going to be there, except in spirit. I still watch your discussion closely though so when I am able to go, I will have half a clue. I’m looking forward to both author breakfasts and the Editor’s Buzz. Other than that, I’ll wing it. I’m sure I’ll see you somewhere – I won’t be at the con, but I plan to go to the reception Thursday afternoon. I hope you have a ton of fun at BEA! I am so bummed I can’t go–maybe next year. I can’t wait for SO MANY things. I’ve never been to an author signing so I can’t wait to do that (and do that, and do that, and do that)! I can’t wait to meet bloggers in real life! I can’t wait to see what new books are coming out this fall! Elizabeth Scott – 1:30-2:00 PM on Wednesday and Richelle Mead 3:00-4:00 PM on Wednesday I think are my big two! Just found out Tim Gunn (of Project Runway) is going to be there, I’m very very excited for that too. He’s a ticketed event on Thursday. I’m not sure that I will attend all of these given there is so much to do at BEA…but these are the ones I’m considering. Plans to meet up sound great. Even in my finals haze actively seeking procrastination, I couldn’t handle the Web site. Thanks for organizing information! I’m coming in Tuesday around noon and leaving Saturday around noon. I’ve love to meet up! I have a bunch of other signings I’ll try to fit in as well as walking around the booths. This is a great idea! I have no idea what to expect, so I don’t know what I’m looking forward to. I usually plan out my entire vacation, but this time I’m winging it! I’ll be in NY from 5/22-5/29 and while I’ll be at BEA on WED and Thursday, who knows what I’ll be doing! I’d love to meet up, though! I’m looking forward to meeting people, particularly other bloggers. I hope we can meet up at some point– I’m in NY from Sunday evening through Saturday afternoon. I’m pretty clueless as to what I will be doing! I’m going to try to strike a balance between pre-planning, going with the flow, and following people around like a lost puppy. I’ve never been to NY before, and I’m really hoping to take in a show at some point during my time there– as much as it seems like heresy, I may need a break from all out bookish socializing. Is anyone else interested in this? Thanks for helping to organize us all! Hi Jenn, the one sure thing I know I am doing is the children’s author breakfast. I don’t like the BEA site either. I’m no help because I can’t seem to figure it all out either. I can’t even figure out what the ticketed events and non-ticketed are, haha. 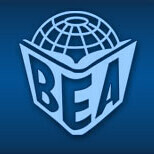 This will be my first year to attend the BEA’s and Im really excited about the book blogger convention as well! A friend of mine from Goodreads.com explained that the easiest way to preplan is to print out the In Booth signings by Author and Autographing Area by Date and Time, and then take a highlighter to those that catch your fancy. So that is my plan of attack. I will be there Wednesday and Thursday for the BEA, most likely wearing my TNBBC t-shirt (so people will be able to recognize me).. so feel free to walk up and say hi!! I would love to meet other bloggers. Being a ridiculous super-plan-ahead-er, I’ve forced myself through the chaos that is the BEA schedule website and come up with an enormous list of things I’m interested in. I’ve compiled it into a Google Doc and will next figure out which of the many conflicting events I most want to attend. Because yes, I AM a complete nerd like that. I’m putting together a Google Doc too, with all the events — including after-hours social stuff and the stuff I have tickets too — I’m planning on attending. I’ve also printed out the In-Booth and Autographing pdfs as well – and will highlight like crazy. I can’t handle NOT being well-prepared for this. It might give me hives. But I’ll post here again when my docs and plans are all figured out. I’m stressed just looking at the freakin’ BEA website! I’ll be there Wednesday-Saturday, so I definitely want to check out some things at BEA while doing some touristy stuff with DH and parents who are coming along with me. I’ll definitely be at the blogger conference all day Friday. I will not be overwhelmed, I will not be overwhelmed. I’m trying to be methodical, and taking LOTS of tips from other bloggers in setting up a rough (and flexible) agenda for myself. I think as first-timers, many of us are going to figure it out as we go.